The Phoenix Command: Artillery System is a part of the Phoenix Command Combat System, covering the use of Artillery. This supplement to the Phoenix Command Mechanized Combat System provides the Weapon Data for the primary Anti-Tank Guns of World War II. Included are the 24 most prominent Anti-Tank Guns of the war, from the German 37mm Pak 36 to the devastating 88mm Pak 43, and from the British 2 Pounder to the US M5 3 Inch Gun and the Soviet 100mm D-10. Full descriptions of each Gun are also given, as are the special rules for using World War II Anti-Tank Guns." "Clever illusionists and sly practical jokers. Brilliant burglars and easygoing farmers. Now The Complete Book of Gnomes and Halflings reveals the secrets of these two popular races--their culture, beliefs, and subraces (including two new subraces), as well as twenty-eight new character kits, from the gnome Goblinsticker to the halfling Forestwalker. 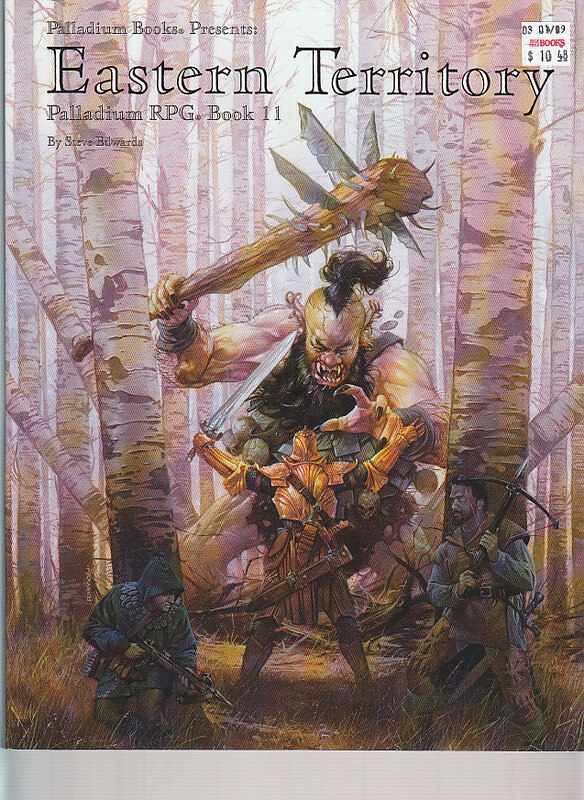 If you enjoy playing gnome or halfling characters, or if you're a DM(TM) interested in creating an all-gnome or all-halfling campaign, this is the book for you!" "Battle axes and beards. Good companions when traveling underground. Handy with tools. If that was your view of dwarves, you need The Complete Book of Dwarves. Discover 24 new character kits, new weapons, and new possibilities, including six dwarf subraces, new proficiencies, strongholds, origin myths, and a look at dwarven personalities. After reading The Complete Book of Dwarves, you may still look down on these short folk... but only to see them!" "If you thought all wizards were alike, think again! 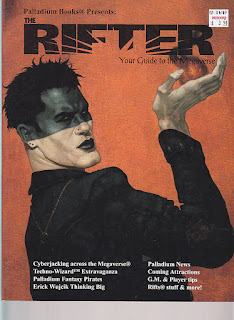 The masters of magic now have a new guide to creating more interesting and imaginative mages, just when you thought you had them "figured out." The Complete Wizard's Handbook will put a whole new twist on wizards from personality and dress codes to schools of magic to building that dream laboratory. Look out, world - you'll never look at a mage the same way again!" "Open locks; hide in shadows; move silently; find traps. If you thought that was all a thief was good for, think again. The masters of skulking an skullduggery are a force to be reckoned with. Is anyone or anything safe from a person who might be anywhere, anytime? Learn the thief's most closely guarded secrets in this devious accessory for the AD&D game." "If you have been intrigued by the Dragonlance setting, but have felt intimidated by the sheer amount of information it comprises, this is the book for you. This book will not baffle you with "game jargon." 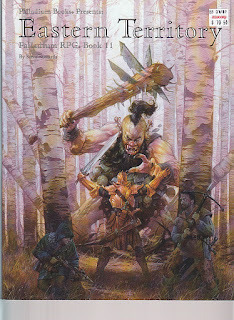 It presents the world of Krynn in a manner you are sure to find entertaining and informative. Through a combination of original fiction and long-established fact, you will discover the continent of Ansalon -- home to the Heroes of the Lance. You will find information about the races of the world, its major cities and regions, its deities, and its monsters. You will read the River of Time, the chronological history of Krynn. Open this book, and open the world!" "The infamous Yin-Sloth jungles are finally mapped and described. 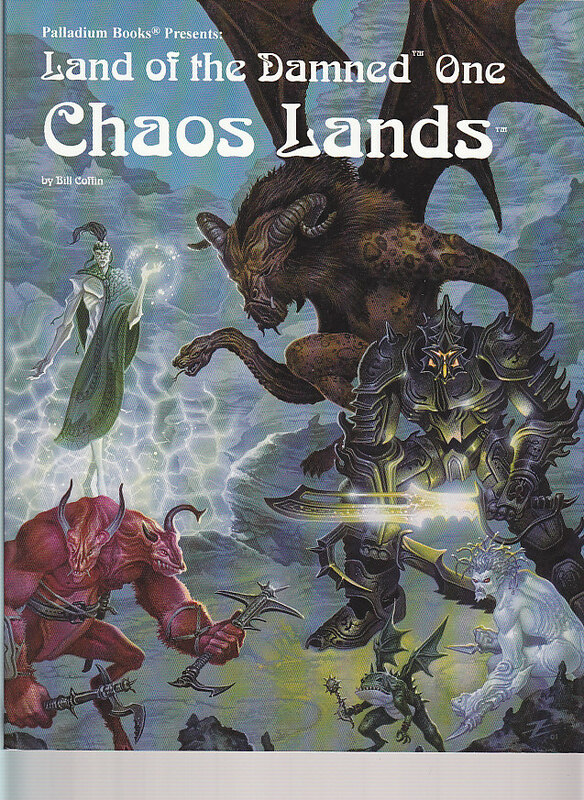 This tome is filled with new character classes, monsters, skills, places, villains and adventure. The Yin-Sloth Jungles, towns and villages mapped and described." "Issue Six of Palladium Games' quarterly magazine. 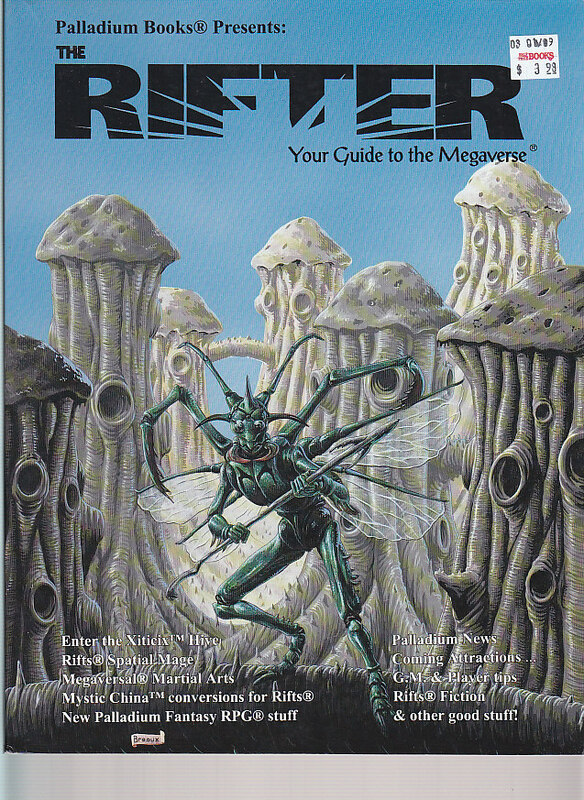 Also Includes fiction by James Cannon & David Haendler"
"Issue Five of Palladium Games' quarterly magazine. 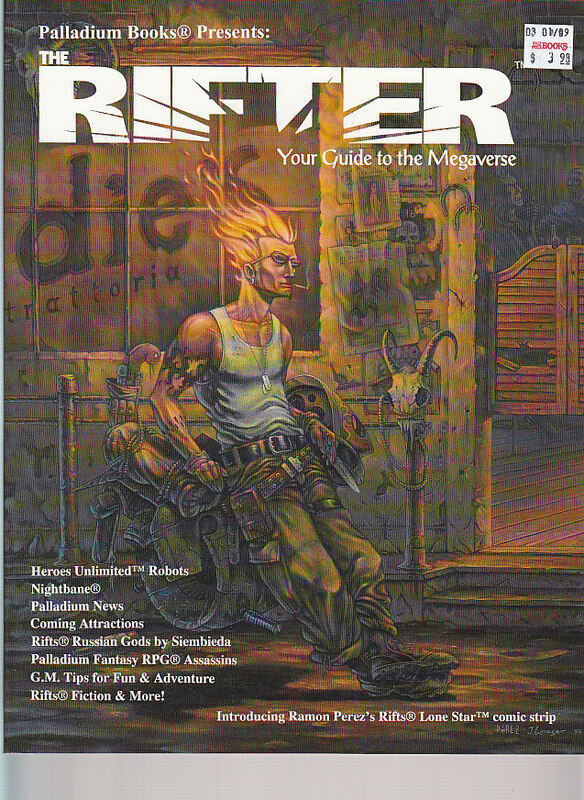 "The Rifter 4 is the fourth issue of Palladium Games' quarterly magazine. 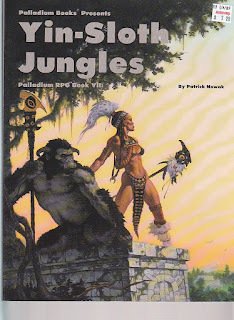 Besides the usual news and updates on Palladium, this issue has a couple lengthy articles on Palladium Fantasy RPG GMing, Rifts source material and adventures, and Steve Trustum's Werebeast OCC for Nightbane. 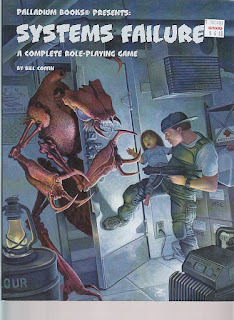 Includes continuing serialized fiction by David Haendler and James M. G. Cannon. 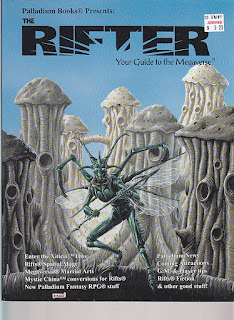 Cover art by Michael Dubisch." "The Rifter #3 is the third issue of Palladium's quarterly magazine. 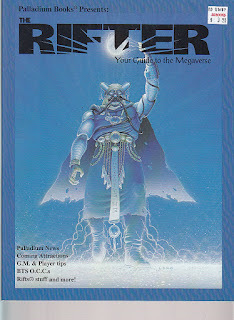 It has news, errata, and updates on Palladium games, as well as original content. 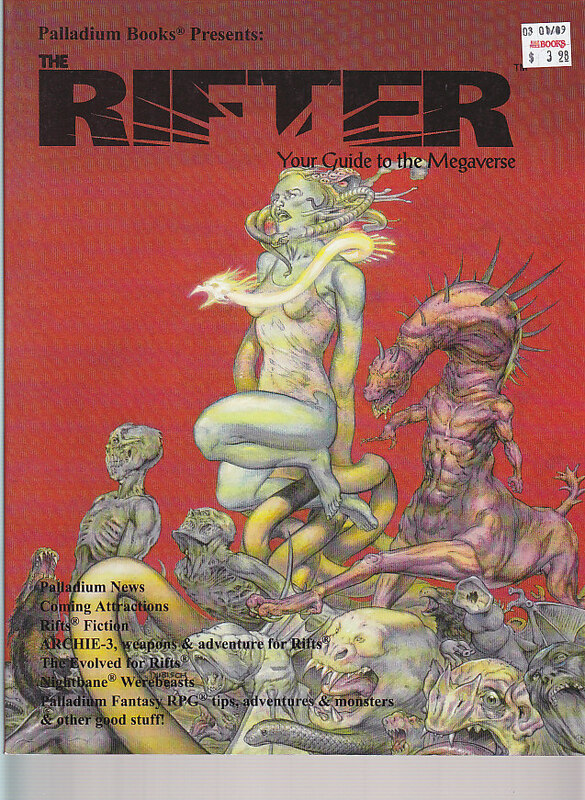 Among that original content are two length articles on martial arts in Megaversal games, Wayne Breaux Jr's detailed look at the Xiticix, and Andrew Smith's conversion rules for using Mystic China in Rifts." Palladium Fantasy Pirates & Imps. Knights of the Dinner Table comic strip by Blackburn. Rift: Siege of Tolkeen - a serialized novella." 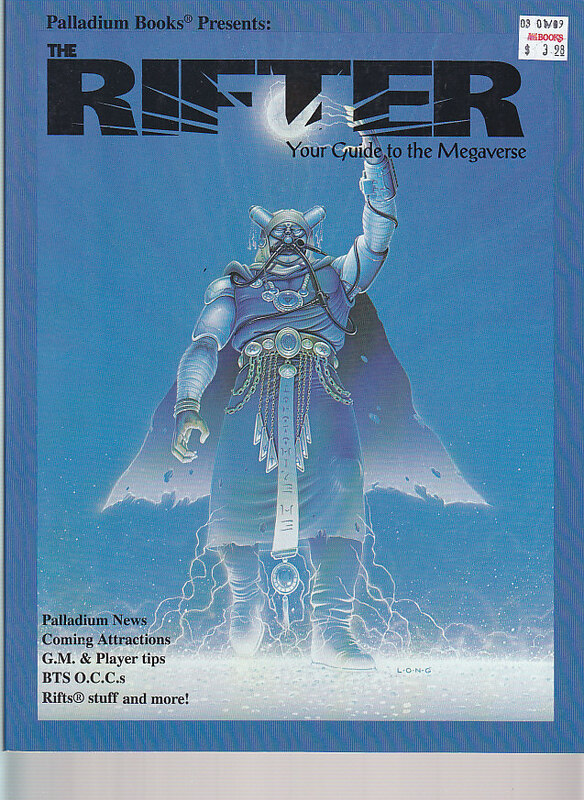 "A synthesis of Game Master and Players' Guide, talent show, fan forum, news/house organ, sourcebook and fun for the entire Megaverse of Palladium RPGs. Every issue, unique and informative. Optional Nightbane Morphus tables & Beyond the Supernatural O.C.C.s. How to name characters by Erick Wujcik. Rifts: Siege on Tolkeen - a serialized novella. 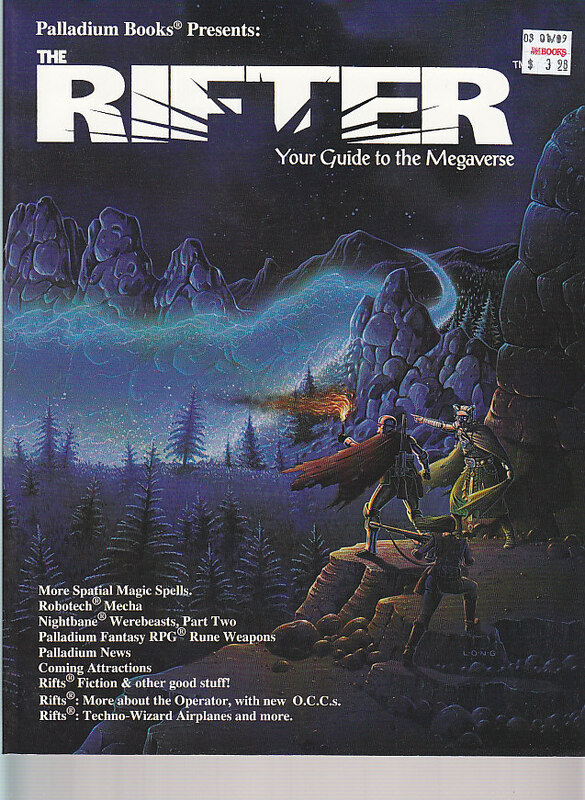 A bunch of Rifts RPG stuffand a whole lot more!" 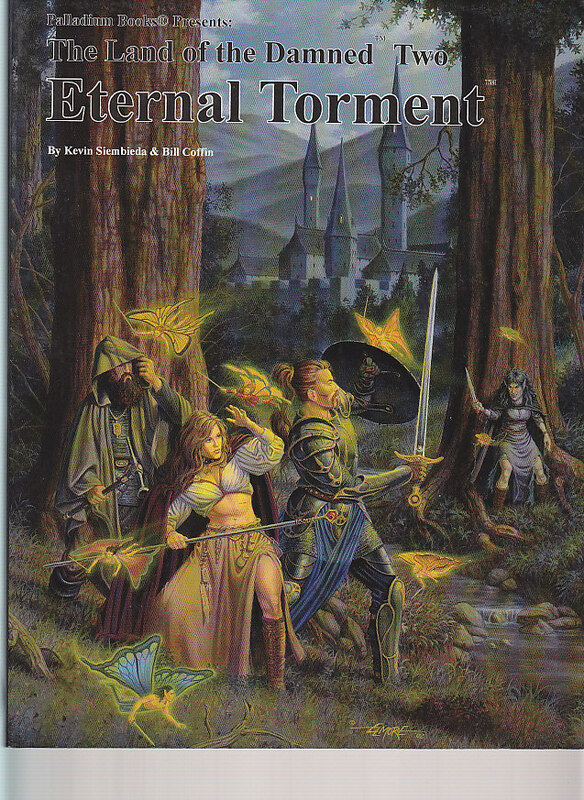 "A 224 page fantasy sourcebook packed with towns, cities, monsters and adventure in the Eastern Territory. This region of the Palladium World has never been described in the past, and is one of the most anticipated books in the Fantasy line, don’t miss out. Over 25 pages of maps! Notable cities and towns, each unique and different. The Danzi, a new optional race of warriors and shamans. Danzi Spirit Tattoos and Elven Mosaic magic. Overview of the land and society. Hints about the impending Wolfen Wars. All kinds of avenues of adventure." Systems Failure is non-stop, blood and guts action! A story of loss, rebirth, and courage. Of self-sacrifice, patriotism, and heroics. Characters are off-color, off-kilter and sometimes just plain crazy, but they are all heroes willing to take a stand. American Civilization (and the world) has collapsed and is dominated by an inhuman foe from another world. it's time she was free again. A truly different and tantalizing spin on the Post Apocalyptic story setting, done with Palladium's no-holds-barred, anything goes approach to things. 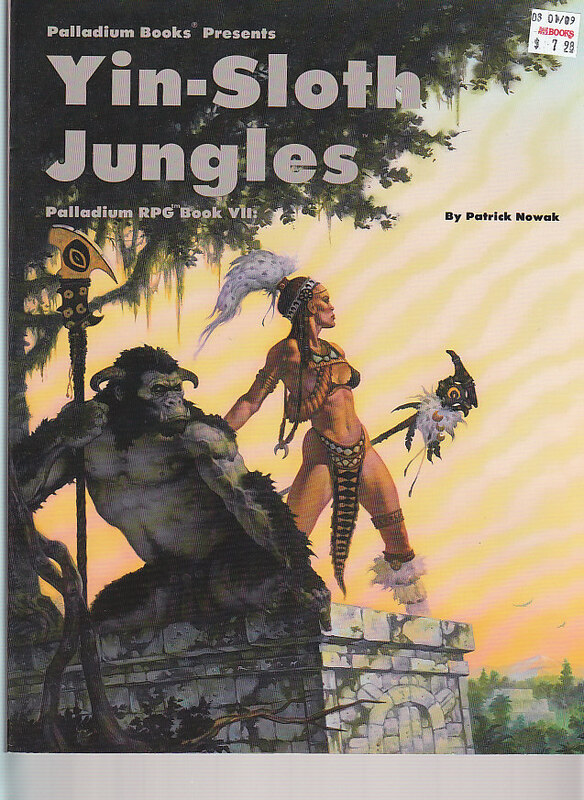 - A complete role-playing game with everything you need to play (other than people and dice) in one book. - 11 O.C.C.s including the Exterminator, Freebooter, Sawbones, Grease Monkey, NORAD Psychic, NORAD Splicer, and Wacko. - Creation rules and colorful background material to make each character unique. - Plenty of maps, world information, and adventure ideas. - Written by Bill Coffin with Kevin Siembieda. "An in-depth look at the fabled Great Library and the many secrets and avenues of adventure it holds. Key leaders, history, enemies, danger and adventure await inside." "The legendary Land of the Damned is said to have been created by the Gods of Light to lock away from the world the Minions of Darkness that once served the Old Ones. - The Land of Eternal Torment, prison to the worst villains of the Chaos War, condemned to walk the earth as the living dead. - 15 types of undead, all but the vampire are new. - 15 Beasts of Chaos - monstrous creations of the Old Ones. - Curses galore, including dozens of new and terrifying ones. - The enchanted forests of the Darkest Heart, home to were-beasts and evil Faeries. The Fallen Palace of Therendil and the promise of redemption. - Over 100 adventure hooks and ideas drawn from rumors and lies. - Regional descriptions, magic items and historical background!!" The Northern Mountains are the first obstacle one must brave to gain entry - higher than Earth's tallest mountains, plagued by monsters and demons, and littered with the bones of those who have failed. Beyond the mountains is the Great Rift and the Land of the Damned. A place of mystery and evil, but also of the promise of secrets of magic, forgotten history and great treasure. Join us, if you dare, to explore this cursed realm. The Northern Mountains and their many legends, mysteries and dangers. The Great Rift that divides the Land of the Damned and leads to the pits of Hades. The Tristine Chronicles and history of the region. Over a dozen new monsters (and some old favorites too). Over a dozen new infernal supernatural fiends. Over 200 adventure hooks and ideas drawn from the Tall Tales, Rumors & Lies Tables, Worlds of the Abyss Table, and regional descriptions and historical background!! 192 pages by Bill Coffin." "Look what's here! ADVANCED DUNGEONS & DRAGONS PERMANENT CHARACTER FOLDER and ADVENTURE RECORDS especially designed for use with ADVANCED DUNGEONS & DRAGONS! These two interlocking products have been designed to eliminate those major problems which commonly plague other character records, space and durability. Organized into a special format, information is grouped together under specific and easy-to-identify sections, while the most vital and oft-consulted information is boxed with eye-catching, easy-to-find displays. All information which remains constant for a character, as well as sufficient space for record-keeping, are provided for on the durable four pages of the PERMANENT CHARACTER FOLDER, while all the information subject to change during an adventure is recorded on separate ADVENTURE RECORDS. When an adventure is ended the complete record may be stored in the PERMANENT CHARACTER FOLDER to serve as a file on past deeds of glory. 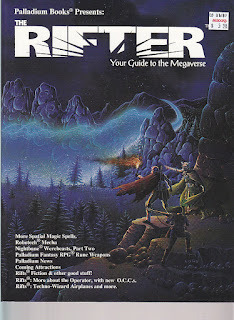 If you find this product helpful you will want to look into the AD&D PLAYER CHARACTER RECORDS, NON-PLAYER CHARACTER RECORDS, and our other quality products and discover why TSR is called, The Game Wizards!" "A millennium has passed since the great war between the Dharzi and Melniboné. With the fall of the ancient Sorcerers the Melnibonéan Dragon Lords became the undisputed masters of their world and the Bright Empire was born. Far to the north of the Dragon Isle a lesser Melnibonéan lord took refuge within the bowels of the Black Isle. Here they transformed the former laboratory of an Dharzi mage into a magnificent stronghold. The years passed and the Bright Empire began it's inevitable decline into decadence and ruin. The caverns of the Black Isle were finally abandoned. Four hundred fifty years later something dark and malevolent now inhabits Fang Island. Here the natural order of living things are being twisted into abominations. Lord Straasha summons champions to the coast of Takesh bordering the Pale Sea and the unholy domain of forbidden Pan Tang. Visions of bloody waves haunt the dreams of these heroes foretelling a great doom should they fail to heed mighty Straasha's call. Can a handful of heroes stand up to the Darkness that again threatens the Young Kingdoms? 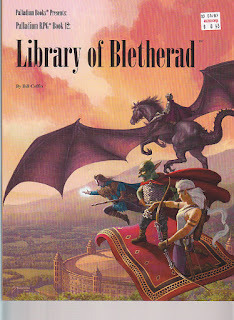 Includes five independent adventures in the world of Elric. each of these adventures explores sites scattered across the world of the Young Kingdoms, revealing marvelous, mysterious, and treacherous locals: a sargasso sea of ruined ships known as the Floating Realm; the Link Machine which slowly mutates the flying race of Myyrhyn; the Storm of Chaos which carries the monstrous legions of Queen Xiombarg hastening the appearance of the Infinite Cathedral of Gormweller the God Seller; the black Fang Island where hideous experiments transform the island dwellers into abomination; Doom Point where a cursed jewel leads to war." "Heroic Adventure in King Arthur's Britain. Blood and Lust provides four adventures and background material set across the Isle of Britain in Cambria, Logres, Anglia and elsewhere. 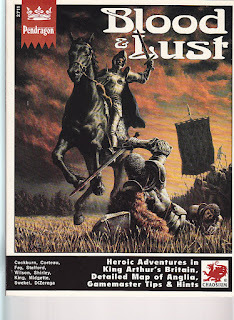 These adventures can either be played singly or can be arranged and linked to create a King Arthur Pendragon campaign. Various player handouts are provided, as well as a detailed map of the Dukedom of Anglia." "We invite you to step onto the world of Pelicar. This is a game world that offers consistency, handling both diversity and complexity, without complication. The Official Game Book is the first step of a presentation of a new era in gaming. 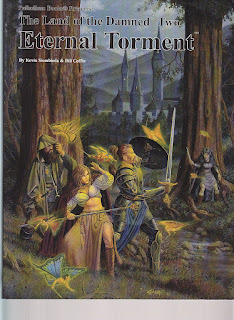 With complete rules, skills, spells, pantheons, a bestiary and more, the Official Game Book can stand alone, designed to give you, the gamer, more action, adventure and fantasy realism than ever seen before." "...And you thought you knew everything about the good, old D&D® game world! The Sea of Dread is home to not one, but several aquatic nations. There underneath the surface, lie mysterious caverns, submerged cities never explored by surface folk, shipwrecked remnants of historic naval battles, and countless frightening guardians of the deep. Discover the power of the kna, meet the kind people of smaar, and face the ultimate threat to the fabulous Realms of Undersea. The Sea People is the third book in the Creature Crucible series that completes the Gazetteer line. It is also fully adaptable to the ADVANCED DUNGEONS & DRAGONS® 2nd Edition game. New rules detailing underwater spell casting and magical items. Don't miss PC1: Tall Tales of the Wee Folk or PC2: Top Ballista!" "The Palladium Book of Weapons and Assassins is the third book in the renowned Palladium weapons series. Weapons and Assassins explores the assassin societies throughout history (such as the Ninja and Thuga), examining their methods, weapons, tools and poisons. Why did these societies come to exist? How deadly were they? What is myth and reality? What secrets made them the powers that they were? The answers are unlocked in the pages of Weapons and Assassins. Over a hundred illustrations depicting weapons, tools, armour, special constructions, costumes, and more fill this 50-page playing aid." "One look will tell you that this book is something special. Page after page of unique and interesting villains, anti-heroes, and secret organizations. No knock-off "generic" characters in this book! Each and every character is distinct and different, with his own origin, history, personality, powers, and point of view. Homicidal maniacs, would-be world conquerors, speed demons, supernatural monsters, superhuman mutants, aliens, cyborgs, robots, wizards, and much more. All major villains are illustrated by Kevin Long, Kevin Siembieda and/or Mike Gustovich. Plus adventures and adventure ideas. - Over 80 villains and a dozen heroes/anti-heroes. - Secret villainous organizations like the Fabricators and Dark Tribunal; eight in all. - How to design your own super organizations. - S.C.R.E.T. : Superbeing Control, Retrieval, and Elimination Teams government agencies developed to counter the threat of "super humans." - New robots, weapons, gimmicks, equipment and more. - For Heroes Unlimited and compatible with Ninjas & Superspies, Beyond the Supernatural, Rifts, and the entire Palladium Megaverse. - New Material in this revised edition includes the Jury, the secret organization that polices superheroes gone bad." THE SCENARIO: is one of survival and desperation. A non-military Earth exploration colony at the edge of the galaxy has been overrun by aliens. Outside help will arrive far too late to provide little more than a eulogy for the dead. THE ALIENS are a race of maniacal creatures of flesh and machine driven to exterminate all humanoid life. However, these creatures, the Mechanoids, must first extract their vengeance through torture, hideous genetic experiments and mind games before laying their victims to rest. ANCIENT SECRETS of superior alien technology lies locked beneath the Earth. Weapons, vehicles and knowledge that could help defeat the Mechanoids if only the human can unearth them in time. 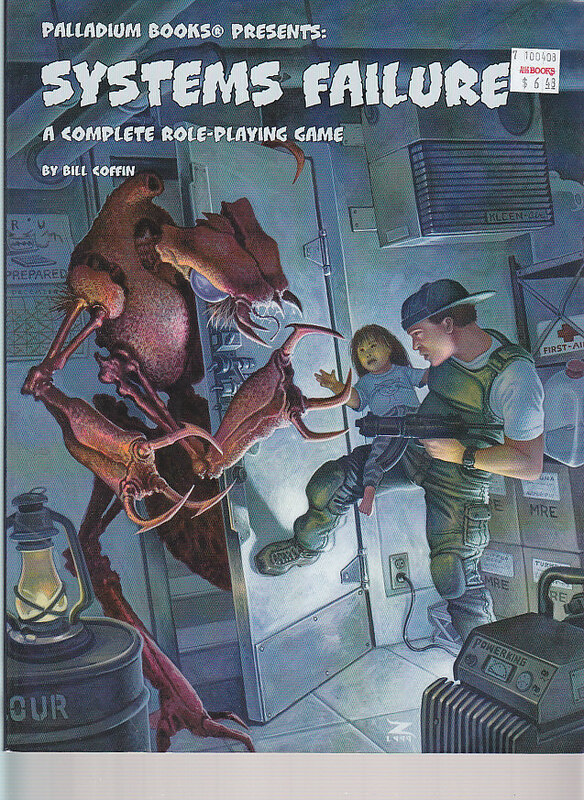 THE MECHANOIDS is NOT a collection of the three original Mechanoid Invasion books, but a continuation of the conflicts and adventures found in the first 48-page game book "The Mechanoid Invasion". This is a fast-paced game of battle, suspense, discovery, death and triumph. It is a streamlined, easily learned game with an emphasis on playability, characterization and action." "The Robotech RPG Book Four implements role playing in the Robotech universe during the second generation of the Robotech saga. From page 5, Introduction: "The Southern Cross is a supplement to the original ROBOTECH RPG: Book One Macross. It is NOT a complete game in itself. Yet, like its predecessor, Southern Cross is directly adapted from the T.V. series"
"The Robotech RPG Book Five allows for role playing in the Robotech universe during the third generation. From page 5, Introduction: "The Invid Invasion is a supplement to the original ROBOTECH RPG, Book One: Macross. It is NOT a complete game in itself! The Invid Invasion is adapted directly from the T.V. series. ALL mecha, weapons, vehicles and equipment found in this book can be seen in the T.V. series. Aided by Japanese translations of the original Mospeada cartoon, conversations with Carl Macek, examination of model sheets and frame by frame viewing of the film sequences have all played a part in revealing the complete story of the Invid Invasion chapter of the Robotech trilogy. Small and obscure details have been restored and put into proper perspective." "Wormwood is the first of many dimension books to be presented by Palladium. A decadent, violent and deadly world ruled by demonic creatures and evil clergy who control powerful kingdoms of monsters and enslave humans. Inhuman destroyers who command the crawling towers and life force cauldrons to do their bidding. One of countless alien worlds linked to Rifts Earth by the many dimensional gateways of the ley lines. The living planet is mapped and key forces described."